Vacation rental house. Sleeps 18, 7 bedrooms, 5.5 bathrooms. No pets allowed. This spacious home (5,069 sq. 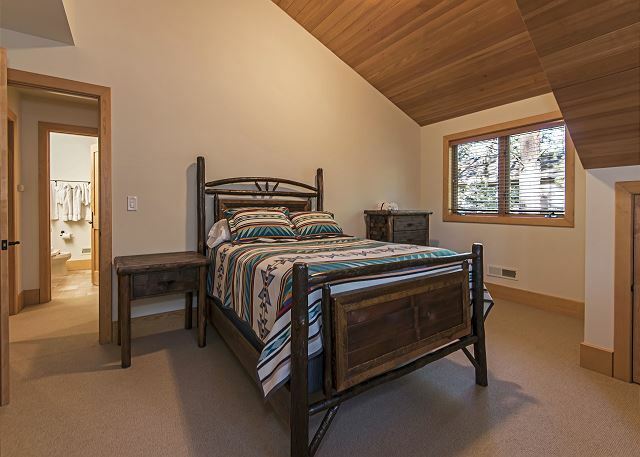 ft) has amazing Lodge/Western decor and features breathtaking meadow, mountain and lake views from most rooms.This extraordinary home embodies the essence of Black Butte Ranch and is aptly named the "Faith, Hope, and Charity Ranch". 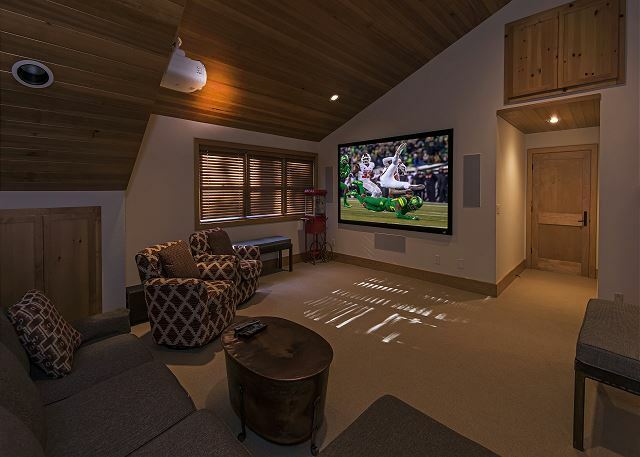 The double door foyer opens to a living area with soaring ceilings and windows.Clerestory windows give rise to the towering Ponderosa Pines and beautiful high country skies and stars at night. 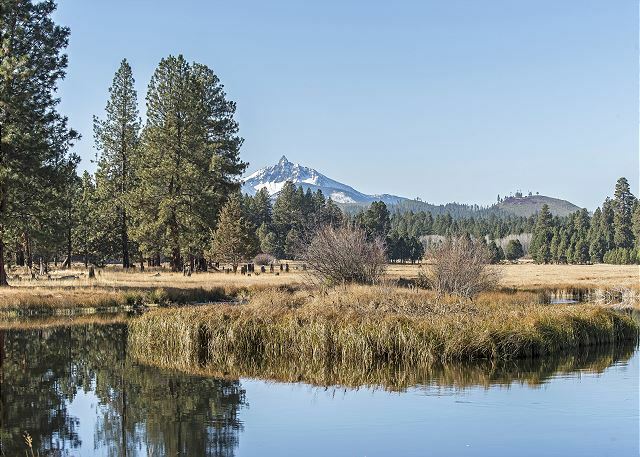 Spectacular meadow, lake and mountain views will greet the visitor, plus an occasional long horn steer, cattle and horses during the summer season plus abundant wildlife and birds to be seen year round..
A large wood burning fireplace and burrow mantle will add ambiance and warmth on those chilly fall and winter Black Butte evenings. A beautiful lighted metal sculpture of the Three Sisters Mountains depicts the "Faith, Hope and Charity" name and is stunning at night. An extra room off the living area has a television, gas fireplace, game table and sitting bar with two real saddle bar stools! The dining area is off the living area towards the kitchen. A long trestle dining table with two long benches and two double captain's chairs seat twelve diners comfortably. 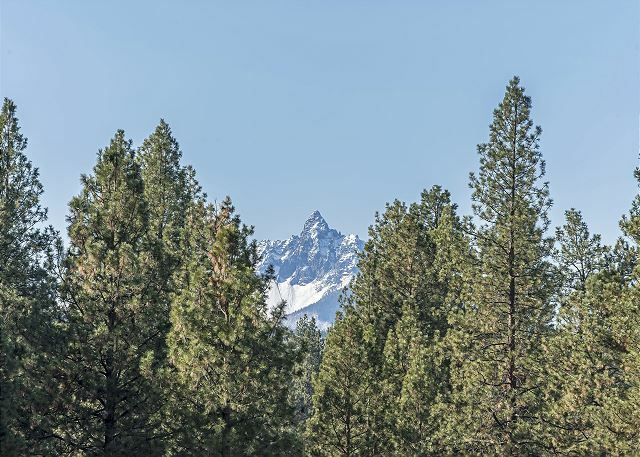 Views of Heron Lake, Glaze Meadow and forest land will add to the enjoyment of meals with family and friends. The impressive kitchen has miles of counter and cupboard space and all the conveniences of home. A double oven will help feed even the largest crowds. A cozy kitchen breakfast nook provides room for overflow diners or for those quiet getaways with coffee and a paper. A half bath off the kitchen has a fun whiskey barrel sink. 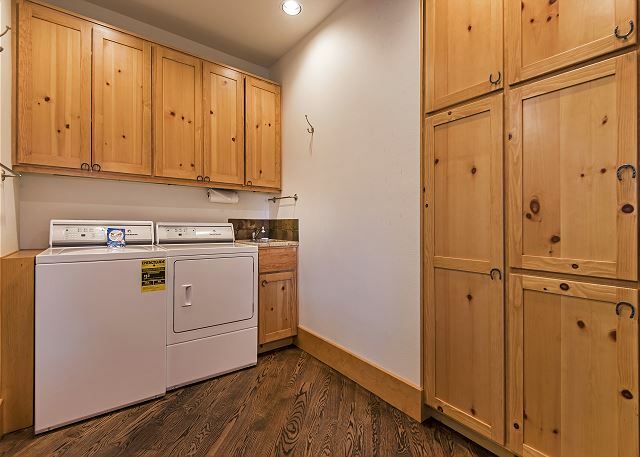 The laundry room and kids' bonus room with two bunk beds and a huge garage completes that lower level wing of the home. Off the living area, on the opposite side is a master suite with queen bed, amazing views and full bathroom. There are two separate staircases with landings to go upstairs. Up the staircase from the living area, the king master bedroom and bathroom suite are to the left. The room is very spacious, with walk in closet and a sitting area with a small television area and stunning views from the second level. There is an outside entry to this room with a staircase downstairs. 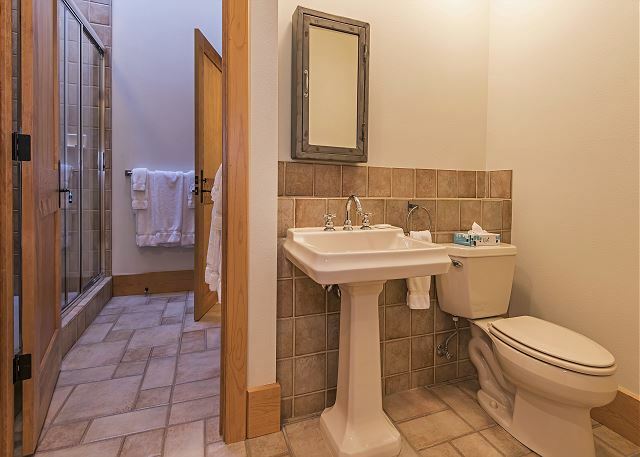 The luxurious bathroom has a large soaking tub, beautiful walk-in tiled shower and double sinks. The breezeway from the master suite leads to a wing of the home that features a large game room with pool table and couch plus a spacious theater room with a projection television screen.Two queen bedrooms are off the theater room with a shared full bath. 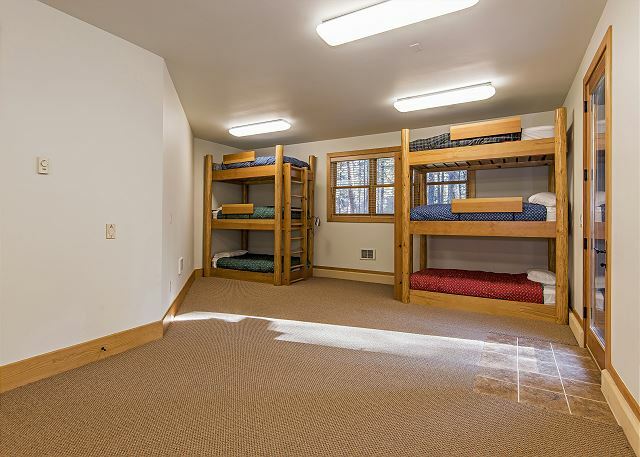 A second double bunk kids' room completes this wing of this amazing vacation rental. The home has surround sound, including on the back deck plus air conditioning. It's just a short bike ride or walk to the Glaze Meadow Amenity Center with endless opportunities for fun activities for the entire family. 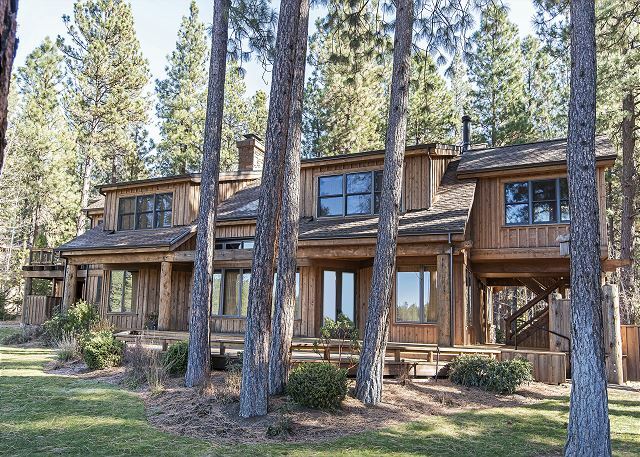 This remarkable home will be sure to surpass all your expectations and take your vacations at Black Butte Ranch to a new level. As a reminder, Black Butte Ranch charges all guests an "Access Fee" which you pay before entering the Ranch, at the Welcome Center. The 2019 fees are $9/per person/per night. They will ask for your license plate number and give you an access code for the security gates. PLEASE NOTE: DURING JULY AND AUGUST there is a 7 night minimum on most properties. If you wish to deviate from that schedule, please call Black Butte Realty Group at eight eight eight seven six two seven seven six three. We had a wonderful, snowy vacation with our family at Glaze Meadow #167. The home is absolutely amazing - clean and spacious. This place was absolutely perfect for my friends and family gathering to celebrate my partner's milestone birthday. The place is beautiful, thoughtfully laid out/ equipped, and super easy to checkin/ out. Would stay here again in a heartbeat! We are so happy you loved this wonderful property and hope you return very soon! This house is amazing. Love it, it's big and has lots of rooms. You get loss in it cause it's so big. We had 4 families stay and no one felt like they were on top of each other. Kids had their space and the adults had theirs. We had great time. We will rent this house again. Very happy to hear you enjoyed GM167!